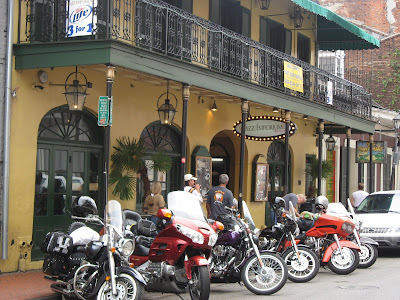 New Orleans has so much to offer a foodie. 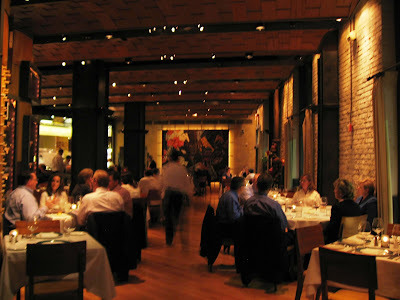 In addition to the unique Creole and Cajun cooking, the city is home many seafood restaurants and upscale fine-dining restaurants, many run by celebrity chefs such as Emeril Lagasse and Paul Prudhomme. 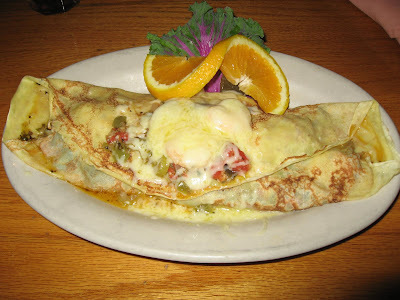 In addition to gumbo, crepes and jambalaya, I saw cafes advertising po' boys - a traditional sandwich of meat or seafood served in a baguette made of Louisiana French bread. 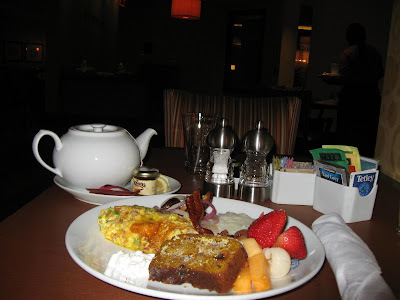 During my three days here, I was able to sample some of these culinary delights that left me wanting more. 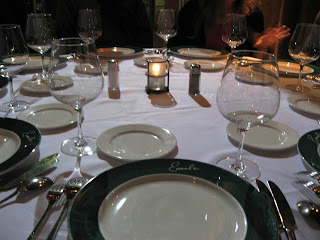 Emeril's NOLA restaurant is located in the heart of the French Quarters. 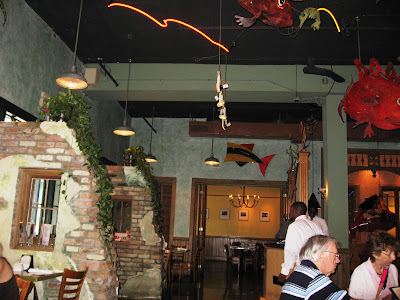 This casual dining restaurant puts a contemprary spin on classic Creole and New Orleans dishes and is very popular, for good reason. I walked in without a reservation and got lucky. There was a group of people waiting for seats, but I was the only one eating alone, and they had exactly one spot free at the Chef's table! 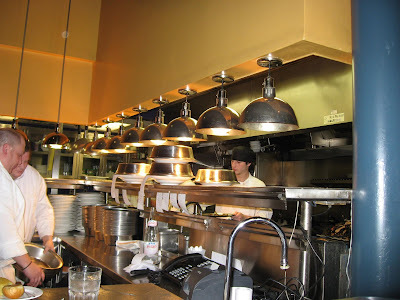 This was a great spot to watch the activity in the open kitchen - activity which was intense and busy throughout. I sipped on a Pinot Noir and nibbled on the excellent spiced cornbread as I awaited my starter and watched the action in the kitchen. 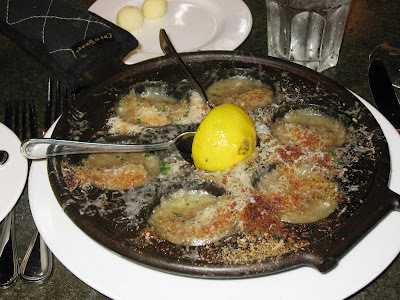 I had ordered Gulf Oysters and Crabmeat, baked in the wood oven with garlic butter and herb bread crumbs. 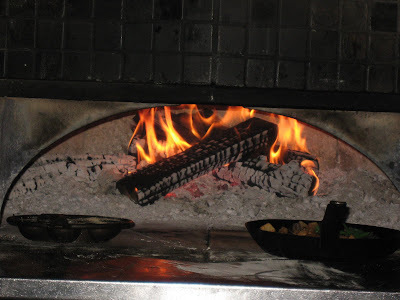 The oysters were cooked right before my eyes in the huge wood-burning oven. The oysters were served in the special iron skillet they were cooked in. I oysters were amazingly delicious. Purists prefer their oysters raw, with no dressing save for lemon juice. Similar to wine, oysters can be very salty or sweet, with notes of cucumber, melon, herbs, butter, flint, or copper, all depending on the water in which they grew. However, newbies should remember Jonathan Swift who said, "He was a bold man that first ate an oyster". 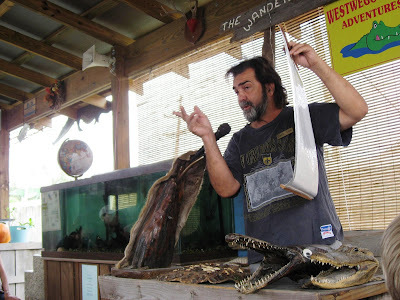 For you, cooked oysters may be a good way to get used to the taste. 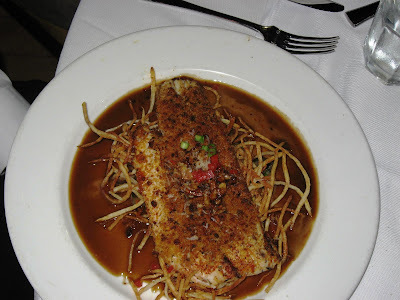 For my entree, I had selected their signature Garlic Crusted Texas Redfish which was cooked in the wood-burning oven with Brabant potatoes, wild mushrooms, bacon, and Sauce Beurre Rouge. 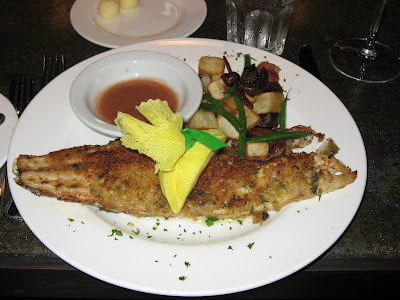 This was another standout dish that I thoroughly enjoyed and will recommend to anyone who visits this restaurant. 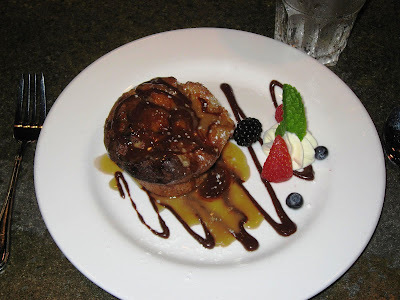 The dessert was a double chocolate bread pudding, good but not particularly noteworthy. 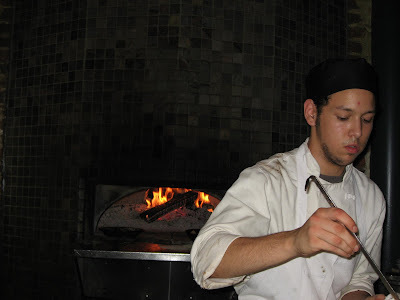 The service was exceptional; the waitstaff was fast, friendly and helpful throughout. I noticed the restaurant was filled to capacity during the entire time and there were people waiting for seats even when I walked out satiated. 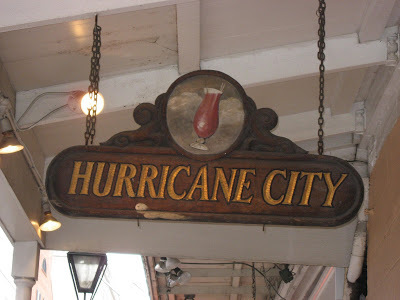 For lunch the next day, I strolled into another great place on the (in)famous Bourbon Street. 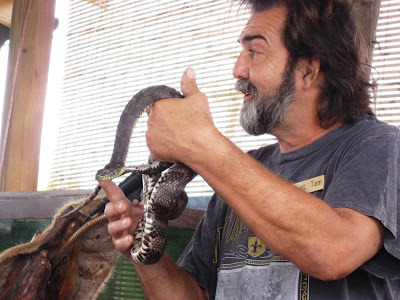 Ralph Brennan is one of the town's most respected restauranters and a visit to Red Fish Grill, which he owns and runs, will show you why. 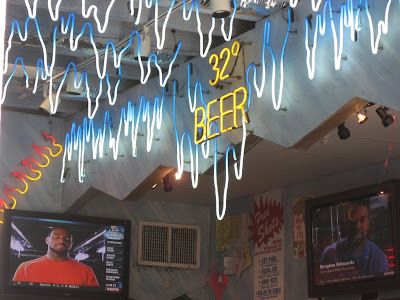 The restaurant’s decor features a sea colored etched floor, hand-painted tables, oyster mirrors, sculptured palms, photographs of Louisiana bayous and bayou residents and a sea of metal fish in neon swimming overhead. The food is equally interesting. 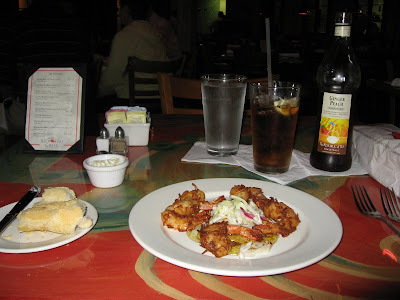 I began with the Coconut Crusted Shrimp, which is jumbo Louisiana shrimp fried in a sweet coconut batter, and served with Cajun cole slaw and pepper jelly. 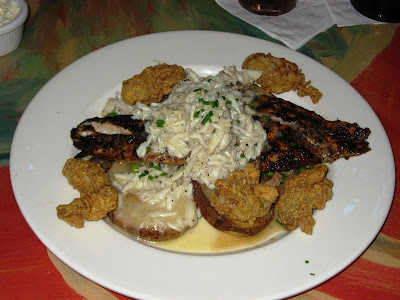 I followed with the Hickory Grilled Redfish, a fillet of fresh redfish grilled over hickory and served with tasso and wild mushroom Pontalba potatoes, topped with Louisiana lump crabmeat and lemon butter sauce. My waitress also added some batter-fried oysters as a side. 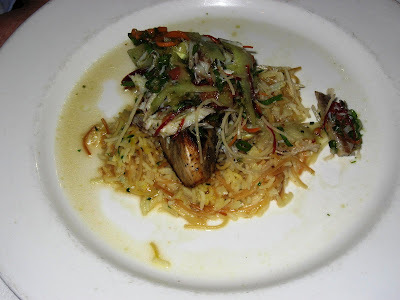 While the shrimp was interesting, it was the redfish entree which was truely memorable. 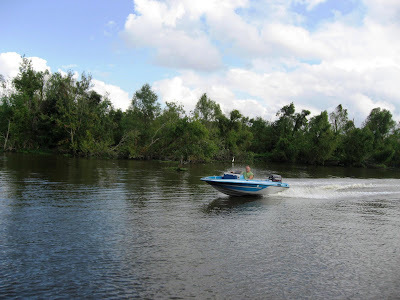 This restaurant also boasts of a well-stocked oyster bar which is worth trying. 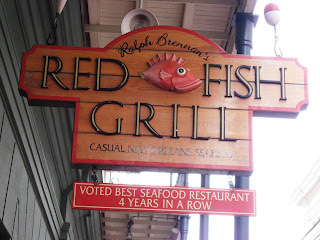 Incidentally, Red Fish Grill was the first prominent restaurant to reopen after Katrina, exactly 31 days after the hurricane devastated this city. There are other restaurants that were on my list but I didn't have the time. 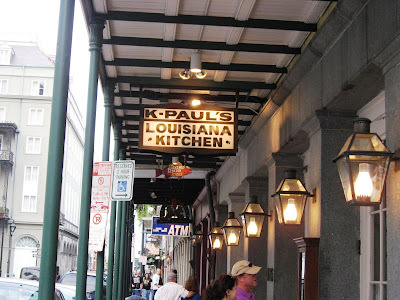 I am told K-Paul's is one of the most popular ones here; however, I discovered they don't open on Sundays! 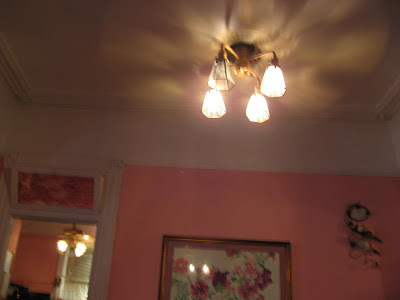 Another interesting restaurant with a British ambiance and great food is the Bombay Club. 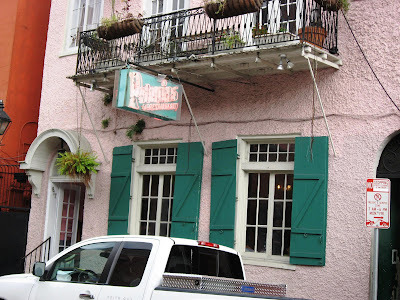 Both these restaurants are in the French Quarters area. 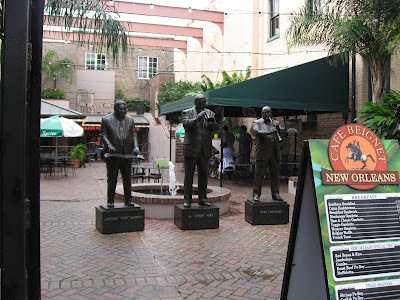 The jazz funeral scene from the James Bond movie, Live and Let Die always comes to mind when I think of New Orleans. This unique New Orleans tradition consists of a brass band followed by two lines of mourners and the casket. 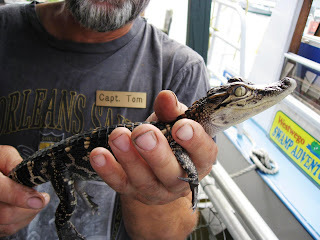 That's just one of many unique traditions of the Big Easy. No one quite knows how the city got it's nick name. Many speculate the name was given by the many musicians who found this a easy place to ply their trade; others say it was because of the relaxed laws on alcohol and low costs of living. 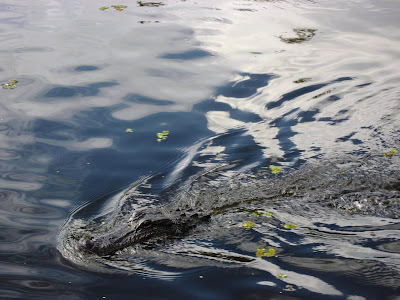 There are many things about New Orleans that make it worth a visit (or two): the historic French Quarters; the unique Creole and Cajun culinary tradition; and of course, Mardi Gras. 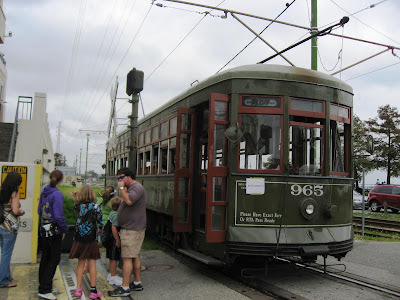 New Orleans and Rio are the two cities most known for its Mardi Gras celebrations. Shops lining the streets near my hotel were filled with Mardi Gras masks, bead necklaces and voodoo dolls. 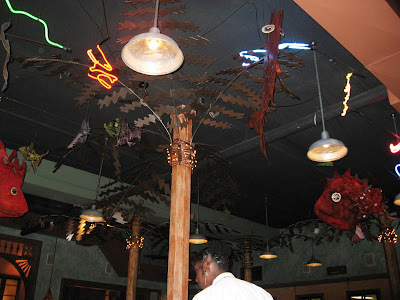 Art celebrating the history of blacks and books on Creole-Cajun cooking were everywhere too. 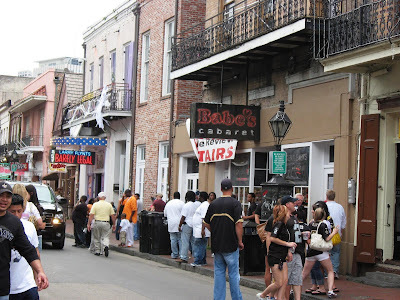 Neighbouring Bourbon Street - filled with strip clubs, saloons and bars - was particularly festive on this day due to the game being held. 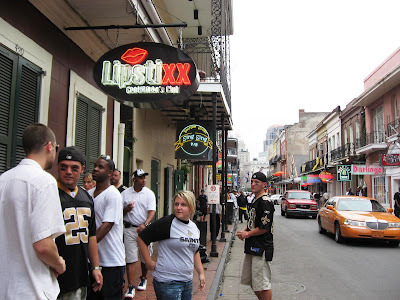 The local New Orleans Saints won decisively leading to more celebrations on these streets. Loud music, drinking and dancing followed all the way into the night! 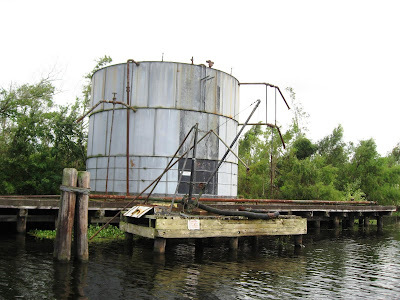 The French owned the port of Orleans until Napolean sold this territory to America! This city was also under Spanish rule for a while. 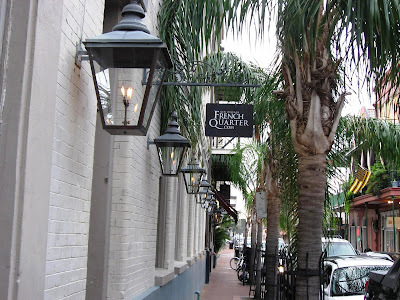 The French Quarters are a reminder of the French past and one of the city's most popular attractions. 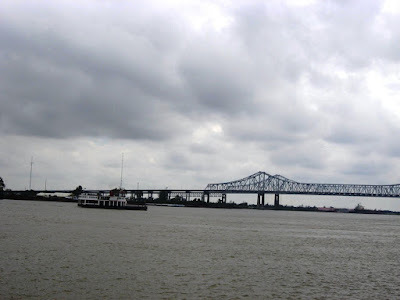 The unique culinary tradition also comes from this city's rich multi-cultural past, primarily Creole and Cajun. 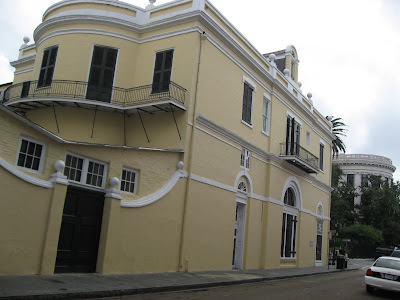 A Creole is anyone born in the colonies of European ancestry, French or Spanish or both. 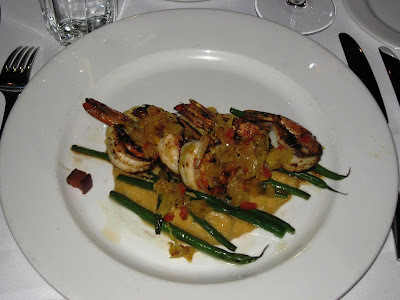 Creole cuisine developed in New Orleans from a mixture of traditions of many nationalities - the culinary arts of the French, of Spain mixed with the American Indian influence, and all stirred together with the natural skill of the African. 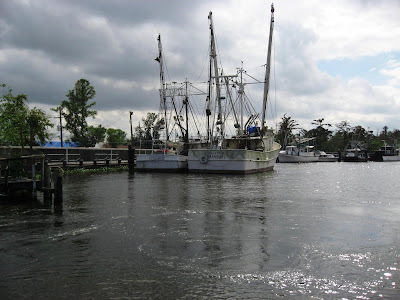 Cooking ingredients were plentiful here; seafood and wild game, wild herbs and vegetables, the best produce from upriver, spices from South America, and worldwide imports into the country's second-largest port. Additional influences came with the German and Italian immigrations just before the turn of the century. 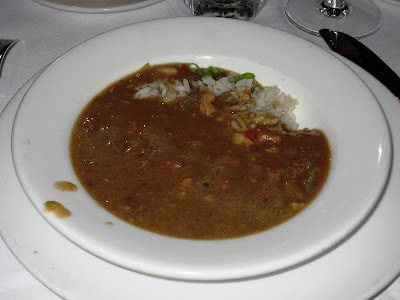 The resulting food is called Creole. 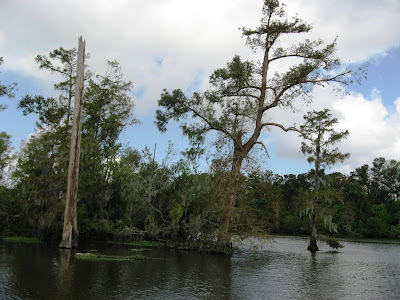 Cajuns originated in southern France, emigrated in the early 1600's and settled a colony called Acadia, when all of Canada was controlled by France. In the mid-1700's the British drove them out when they would not swear allegiance to the King and renamed the the province Nova Scotia. 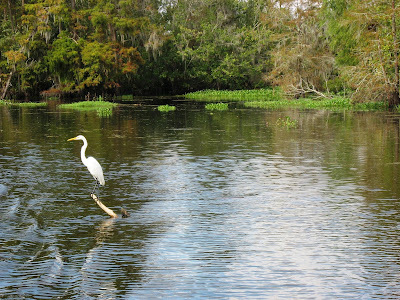 Many of them migrated to Louisiana, where they were welcomed by the large French population. 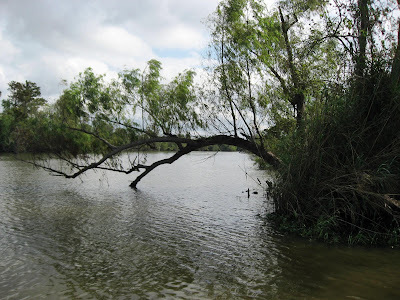 They settled primarily along the waterways of southwest Louisiana and turned to their traditional practice of fishing and farming for a living. Cajun cooking is old French cooking, usually in one big pot, adapted to the ingredients available, expanded by the herbs and spices growing wild in the area. 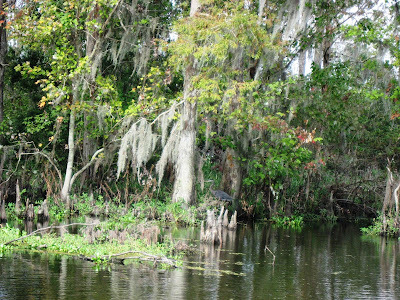 Cajun food was the food of the isolated country people. It took me over 26 hours of flying and waiting in airport lounges to get here. It was a very busy afternoon when I began my trip in Pune. I was on my phone all through check-in and the boarding process. I had run out of charge by the time I got into Mumbai and had to charge the phone as I ate dinner before catching my flight. 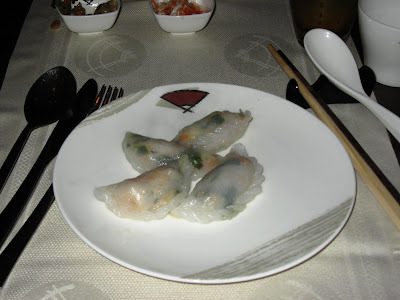 I was at the Pan Asian in the Grand Maratha hotel. The Sichuan Hotpot looked interesting on the menu but that required me to move to a table with a grill in it. I decided to have something else instead. 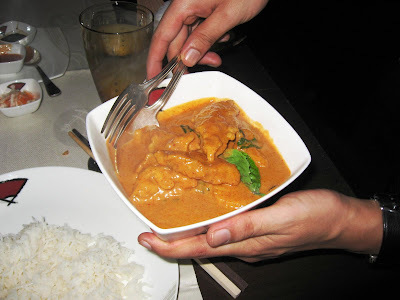 I began with Crystal Prawn Dumpling followed by the Thai red curry with red snapper. 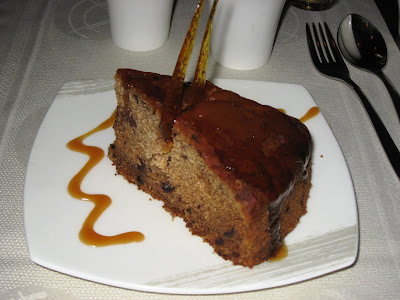 For dessert, I selected the Sticky Date Cake, a reinterpretation of a Balinese recipe with lemon-honey drizzle. 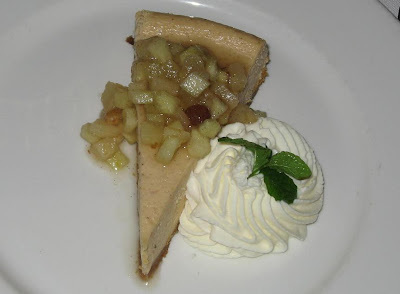 The dumplings were unremarkable, but the red curry was excellent and dessert was very good too. I slept all the way to Singapore. At Singapore, after freshening up at the SilverKris lounge quickly, I boarded the 747 bound for LA via Narita. 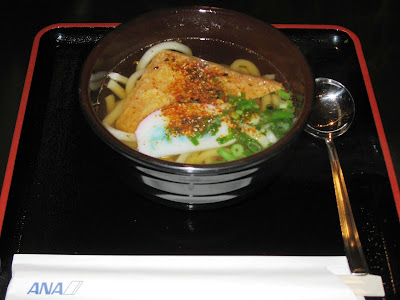 The noodle bar at the ANA lounge in Tokyo revived me with a spicy, hot Udon noodle soup with beancurd. Udon is made of buckwheat and the noodles are thicker than ordinary noodles. I was sufficiently to watch the first two episodes of critically acclaimed Mad Men. Immigration in LA was a breeze but then I found I had a five hour wait before my United Air flight to New Orleans. It was midnight in New Orleans when I got there. 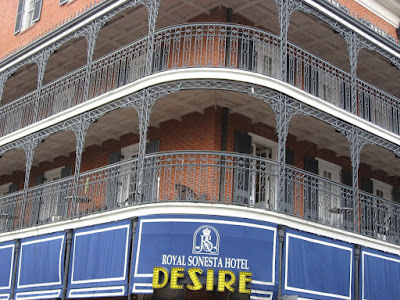 My hotel, the Marriott on Canal Street, was alive and crowded even at that time. I have to mention the high-tech elevators in this hotel (reminded me of the ANA Hotel in Tokyo). You punch the number of your floor into a panel in the elevator bank and it directs you to a particular elevator. When inside the elevator, there are no buttons to punch. I was on the the 22nd floor and the view of the city below was fantastic. Next day I woke up to find I had left my AC adapter home. Thankfully, there was a Radio Shack two blocks away and I found one. 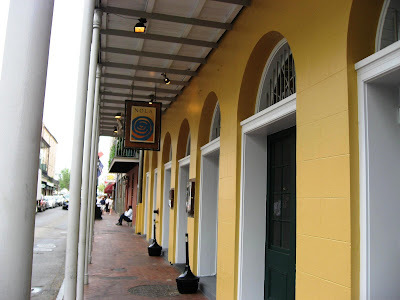 After a hearty breakfast at 5Fifty5, the hotel's lobby restaurant , I was on my way into the French Quarters to discover the many charms of this city.